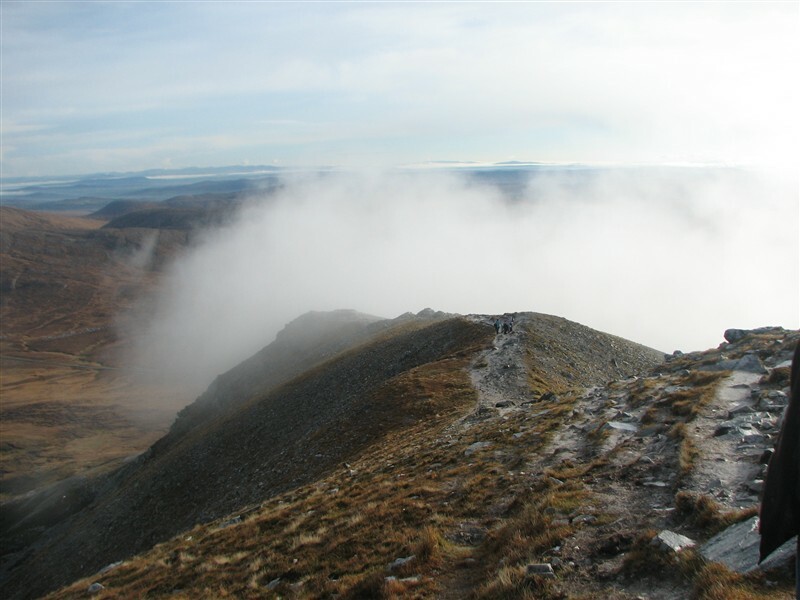 Mount Errigal in Donegal is one of Ireland’s most popular and recognisable mountains. My brother and I walked it on a perfect November day in 2hrs 45 minutes. It’s a short enough walk, but steep and pleasantly airy in places so it’ll definitely get your heart going. If you are lucky enough to get a clear day the views from the top are stunning. Having left Dublin on a Saturday afternoon for the 4hr drive to Gweedore, the night had thoroughly set in by the time we hit the R251 after leaving Letterkenny. In the pitch dark the winding bumpy road lent our drive a truly remote feeling, with no signs of habitation to be seen for significant stretches. As we pulled up to An Chuirt hotel in Gweedore we knew that Errigal was nearby but would have to wait until morning before we got our first view. After dinner and about three pints too many in Sean Og’s of Bunbeg we retired for the night with the intention of getting an early start the next morning. What seemed like five minutes later I was opening the windows to see the sun starting to reveal a near cloudless day in the wilds of Donegal. Soon after we caught our first glimpse of the mountain. It didn’t disappoint. Given my hangover it looked pretty high too. The car park that most people use for Errigal was just ten minutes from the hotel. It’s located at point [B94291 19734] on the R251. From here you can pretty much see your route ahead as Mount Errigal is above to the left and Mackoght to the right. There’s a ‘track’ leading up either side of a stream which gives muddy ground a bad name. We headed up the right hand side and found the going pretty manky, though in hindsight this option is far less wet and mucky than the more direct route on the left hand side of the water. Our path soon picked up a series of cairns which led us to the ridge between Errigal and Mackoght, though not before giving us a hint of the far-reaching views we were going to have higher up the mountain. Already we could see far to the north and east, with the high Crologhan lake beneath Maumlack and the Poisoned Glen slowly revealing themselves. Once we reached the col between the two mountains we took a quick breather before hanging a left and heading for the steep climb up towards the ridge and summit. And it is fairly steep. 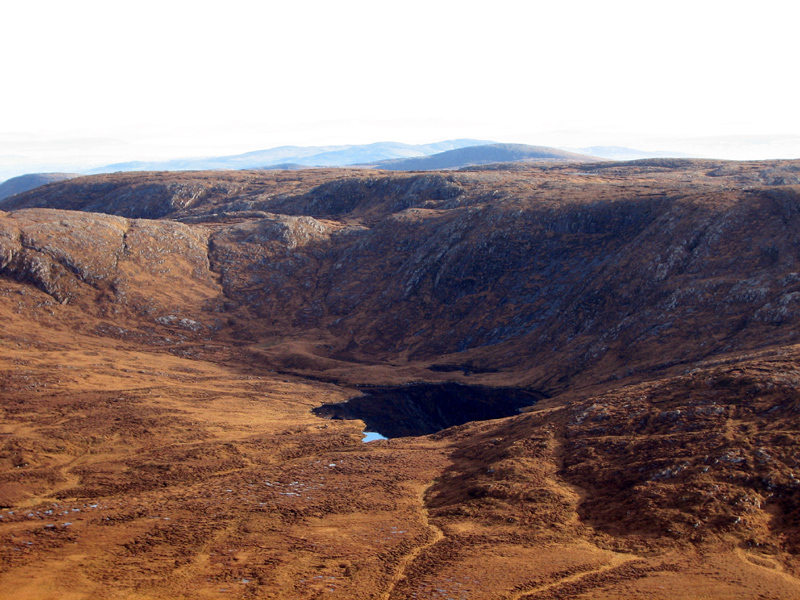 The popularity of this mountain is reflected in the well-defined track that leads through the quartzite band of rock to the point where you reach a large shelter that was erected in memory of a local man who was mistakenly killed by the IRA. His name was Joey Glover and he was responsible for popularising lots of walking and climbing routes in the north. Onwards and upwards. As the ground levelled off the ridge sharpens and you round a pinnacle of rock before the last couple of hundred meters to the summit, during which the path skirts some long drops. 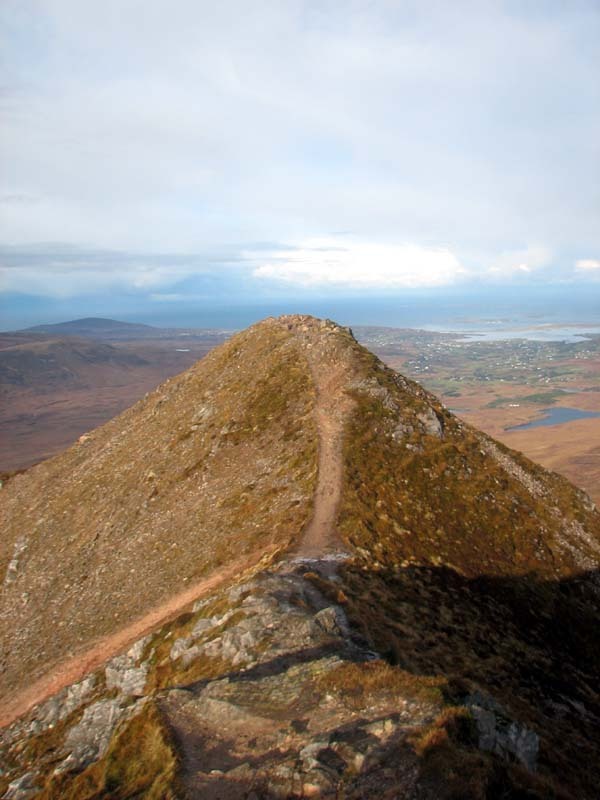 Errigal is topped with twin summits that are said to be among the smallest in Ireland. Separating them in One Man’s Pass – wide enough for just one person at a time – which can be crossed to reach the second slightly lower peak. As we sat enjoying our coffee a man with his two dogs was ascending the final meters of a Southern gully that approaches from the Dunlewey direction. We got to talking and he revealed that he walks the route every Sunday morning! He asked us about our day and the subject of my hiking to the highest point in each county arose, and so we discussed some of the peaks involved such as Sawel in the Sperrins, Benbaun and Arderin in the Slieve Blooms. He asked and I told him that yes there was a charity element to my adventure and we moved on to point out the views we could see such as the far distant Malin Head, Tory Island, the Sperrins and Slieve League. We soon parted ways and made our way back down, this time crossing the sodden ground that leads more directly from the bottom of the scree slope towards the car park. The shortcut isn’t worth it though as it’s like walking through a mud bath the whole way. Much better to retrace your steps towards Mackoght and then descend the (slightly) drier ground. As we squelched into the car park the man we’d met on the summit came over and we spoke some more about the many great hills of Ireland. He then handed me a twenty euro note and asked me about the charity I was doing my walking for. How nice is that? (Particularly since I could have taken the cash and told him I was raising money to help the board of Anglo afford their golf club membership or something.) It turns out he’d gone back down the gully, showered and changed ,and driven up to the car park just to give me some sponsorship. Michael McGeady of Dunlewey, I thank you, your generosity topped off a brilliant day in the hills. We didn’t use OSI Map number 1. I tried to find it in eight shops in the Dublin area to no avail. So, while you can walk the ‘tourist route’ up Errigal without a map, if you plan to do any further walking in the area you’ll need to get organised in advance. We stayed in An Chuirt hotel in Gweedore. There’s a bar, the staff are friendly, and there’s a crazy-golf course. 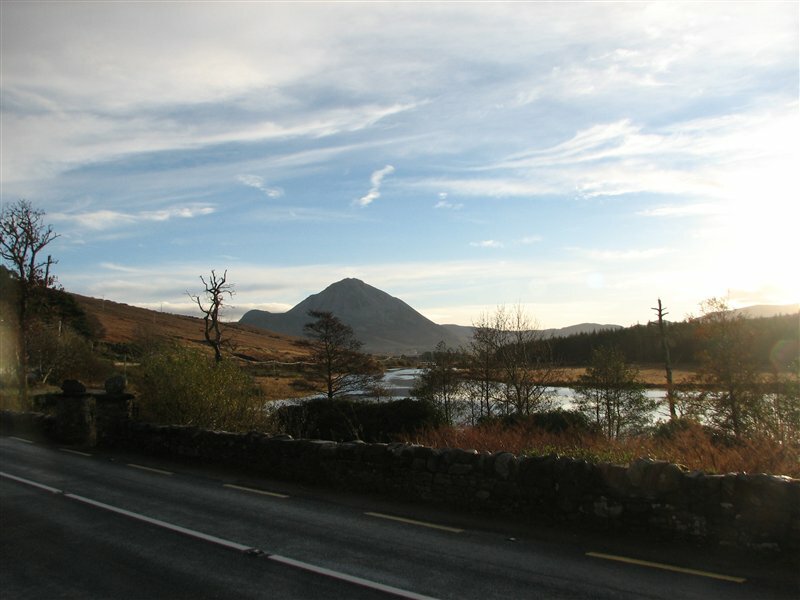 Mountainviews.ie has plenty of route information for Errigal. Great write-up. I love Errigal – really amazing views from the tiny summit. Did you do Muckish as well when you were up that way, it’s another amazing mountain. Very informative and so timely … my family (approx 7 adults and 2 kids) are planning on climbing Errigal sometime next year. Surprised at how clear a day it was considering the horrendous weather now hitting Europe. We are from sunny Queensland in Australia so we ‘ll be hoping to select the best time of the year to venture up the slope! November definitely wasn’t considered a great time of year for such a trip! Any further tips or advice greatly appreciated. Hi Siobhan, yes we got great weather on the day. Everytime of year has it’s advantages – in winter on a clear day the air can be ‘really’ clear and the ground is hard, plus no midges. Autumn and the land takes on a lovely rusty colour, spring you can again have crisp clear days and in summer you get long hours of sunshine + midges and soft ground if there has been rain. Your best chance of good weather in this country is probably during May and June. 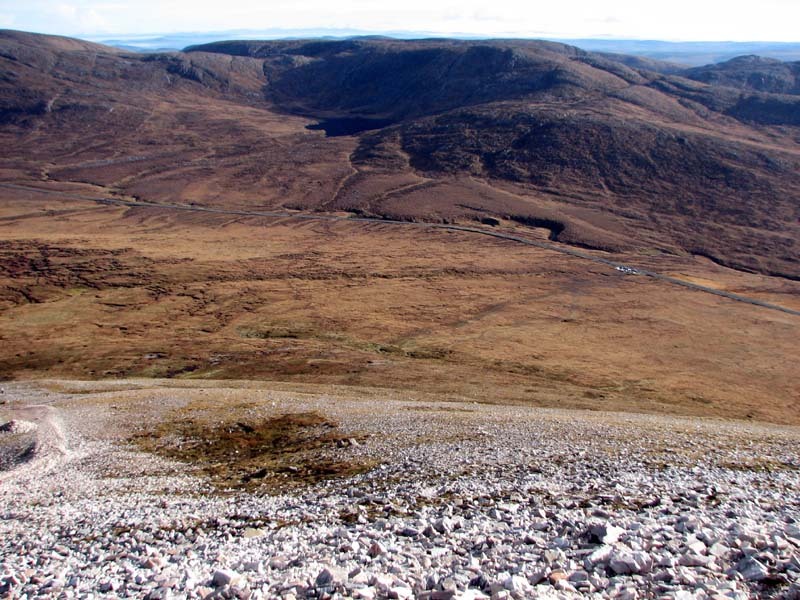 I think Errigal would be great for a family as it feels quite ‘mountainy’ so the kids will love it and as you can see from the video the views are fantastic. Plus there’s lots more to see in the area. If you have any specific questions let me know and I’ll try to help. Thanks John, I hope you enjoyed your hike! Michael and the two dogs.